The most glorified bounty hunter in all the galaxy! He bobbles in adorable Pop! Vinyl! Boba Fett can be yours for a modest price. Inspired by designer toys and stylized character collectibles the world over, Funko is back with 4-inch tall Pop! Vinyl bobble heads. The unique design brings Funko's house style to the world of bobble heads. 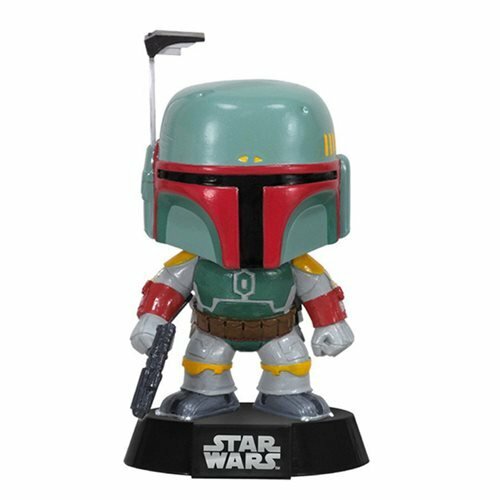 This adorable collectible of bounty hunter Boba Fett comes packaged in a colorful window box. He's going to look great on your desk. Order yours today! Ages 5 and up.